Learn some of the tricks to cooking with garlic. Garlic is not only easy to grow but it’s also amazingly simple to cook with. Arm yourself with these quick garlic cooking tips and you’ll whipping up delicious dishes in no time! Roasted garlic is a treat in and of itself and a snap to make, with many other garlic recipes quick, painless, and oh so good. Garlic is used in cuisines from around the globe, found in dishes in Asia, Europe, Africa, Latin America, and North America — and probably a few scientists in Antarctica spice up their meals with a little garlic powder or cloves they packed. You’ll find garlic in soups, sauces, marinades, pestos, spice rubs, and in stir-frys, as well as in sausages, meatballs, and other ground meats. Bake it, braise it, roast it, or sautee it — it’s always good! Below you’ll find some basic garlic cooking tips to get you off on the right foot if you’re just discovering the wonderful world of cooking with garlic. 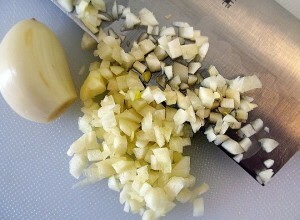 The fine art of mincing garlic. Dark brown is bad: If you’re sauteing garlic, never cook it to the point that it turns a dark brown or black. Garlic gets very bitter when it’s browned too much. Onions may get sweeter as they brown but garlic is just the opposite, so be sure to saute other things first and pop the garlic in towards the end, as it needs very little time in the pan to be done. 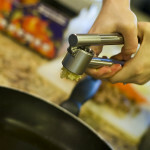 The fine art of mincing garlic: Chopping up or mincing garlic is one of those things that you love or hate (usually to the point of buying a garlic press to avoid it); there’s very little middle ground. Whatever your method, keep in mind that the garlic will taste stronger if you mince it very finely or press it, whereas if you slice it or cut it into larger pieces it won’t taste as strongly. Dry and cool: You can’t cook with great garlic unless you store it properly. 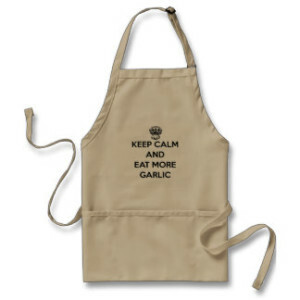 One of the best garlic cooking tips involves storing it correctly: garlic keeps best in a dry, cool environment. Never keep it in the refrigerator and don’t seal it up in an airtight container, as some airflow is good. Roast or bake for a mellow taste: Some garlic varieties can be very spicy and hot if eaten raw or lightly sauteed but even the spiciest of garlics turn very mellow when roasted or baked. Peel garlic in less than 10 seconds: If peeling garlic fills you with dread, fear no more. The below video will show you a very simple trick that will have you peeling garlic like a pro in the blink of an eye.